5 Wash temperatures, catering to the different cycles and dishes. No more bickering over who’s turn it is to wash up! Fits in a generous 6 place settings! It’s easy to add this handy appliance to your kitchen. Bosch Table Top Dishwasher White. and can take any unwanted washer way. MK11/MK12/MK13/MK14/MK15/MK16/MK17/MK19/MK20. MK1/MK2/MK3/MK4/MK5/MK6/MK7/MK8/MK9/MK10. NN7/NN8/NN9/NN10/NN29. 5 Wash temperatures, catering to the different cycles and dishes. Doing exactly what it says on the tin, load your dirty cookware, cutlery and crockery inside and let it do the hard work while you sit back and relax. Spacious yet compact: space for 2 place settings in a small footprint. Klarstein Amazonia Mini Dishwasher 6 Programs LED Display Silver. TheKlarstein Amazonia Minidishwasher takes over the task of washing up from now on. (Orbital wash system. You will require your own furniture door/plinth to attach to front. Noise Level: 46 dB(A) re 1 pW. Total aquastop. W)69cm x D)62cm x H)66cm. Nominal Power: 1.9 kW. Drying Performance: A.
Dishwasher Type. Table Top Dishwasher. Number of Wash Temperatures. 43.8cm(H) 55cm(W) 50cm(D). Annual Energy Consumption. Main Colour. Residual Heat. Noise Level. 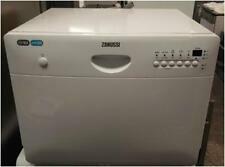 Ideal for Flats, Bedsits , Caravans etc etc Brand new and never used ZANUSSI ZDM17301SA Compact Dishwasher. Item has been stored out of the original packing and has got some minor marks to the top surface that I have tried to shown in the photo’s. These are £300 in Curry’s so grab a bargain. Will not post . Cash on collection only from Sheffield. Thanks for looking. 1 x funnel. Spacious yet compact: space for 2 place settings in a small footprint. Klarstein Amazonia Mini Dishwasher 6 Programs LED Display Blue. TheKlarstein Amazonia Minidishwasher takes over the task of washing up from now on. Six washing programs can be selected easily. The SK26E821EU being economical with water and electricity, but with a noise level of only 48 db also quiet in operation. Manufacturer no. Type dishwasher. 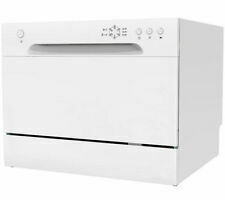 Indesit ICD661 A Freestanding Compact Dishwasher - White. Condition is excellent. Cash on collection. 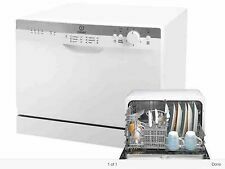 Technical specifications for ZANUSSI ZDM17301SA Compact Dishwasher - Silver. Box contents - Zanussi ZDM17301SA Compact Dishwasher. M & S (U.K.) appliance & Electrical Clearance Centre. Type Compact freestanding dishwasher. Washing the dishes can now be done by the Amazonia 8 Neodishwasher. 2 x cutlery baskets. EcoExcellence system: energy efficiency class A at 205 kWh / year. Energy efficiency class A . Everything in view: simple operation with 6 buttons and LED display. 5 Wash temperatures, catering to the different cycles and dishes. Fits in a generous 6 place settings! No more bickering over who’s turn it is to wash up! This is a graded product. A1 products with no obvious scratches, marks or dents. Pictures are of the item as it is now. Manual and pipe connectors are included in sale. 30 minutes it's more than enough to do the job! It is like to have a personal maid! 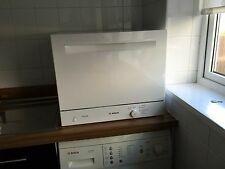 Beko Dishwasher 45cm Width. Condition is very lightly used. Slight bend at bottom of door on bottom left side (shown in photo). Collection from Brentford. 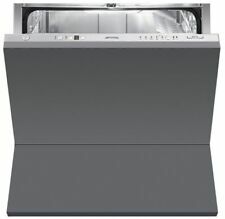 This full size dishwasher allows you to wash up to 15 place settings in one load. 29 Minute rapid wash cycle for a lightly soiled load. 15 Place setting capacity. 29 Minute Rapid Wash Cycle. The 29 minute rapid wash cycle lets you clean lightly dirty dishes in just under half an hour – ideal for a speedy clean up after dinner. SpeedMatic compact dishwasher with good energy and water efficiency through energy efficiency class A and a water consumption of 8 litres per wash. -International order designation: SK25E203EU. -Service material no. : SK25E203EU. 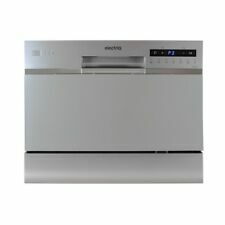 Bosch SKS50E32EU - ActiveWater smart compact dishwasher - desktop unit - white. -International order designation: SKS50E32EU. -Service material no. : SKS50E32EU. -Net weight (kg): 21.0 kg. -Gross weight (kg): 24.0 kg. International order designation: SK26E821EU. -Service material no. : SK26E821EU. 174 energy consumption kWh/year on the basis of 280 standard cleaning cycles in cold water filling and the consumption of the modes of operation with low power consumption. Condition is For parts or not working. Collection in person only. Bosch Dishwasher Table Top Mini Small, RED, Serie 2. To increase our cleaning efficiency we have developed the economical EcoSilence DriveTM. 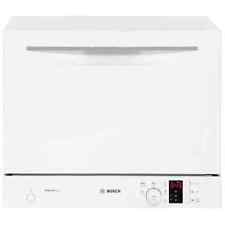 Bosch Dishwasher SKS62E22EU Table, Width 59.5 cm, Number of place settings 6, ,. 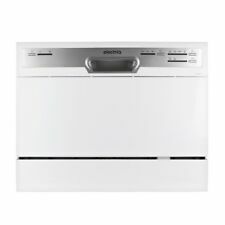 Bosch Dishwasher SKS62E22EU Table, Width 59.5 cm, Number of place settings 6, Number of programs 6, A , AquaStop function, White. Salt indicator Yes. Rinse aid indicator Yes. Number of place settings 6.